It’s December, and it’s beginning to feel a lot like Christmas! A massive part of Christmas is the food, and who doesn’t love food? However, am I the only one who believes that Turkey and Brussel Sprouts are just a bit boring? 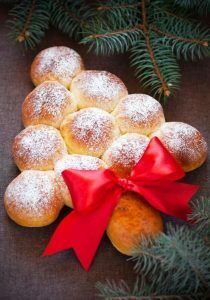 This blog will show you some pizza snacks that can transform your Christmas dinner! 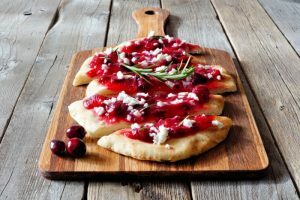 Incredibly different, the Cranberry Sauce, Bacon and Gorgonzola Pastry Pizza is unlike any pizza you have ever had (in a good way!). The pastry base is different in comparison to its heavier counterpart, dough. The blend of the sharp and sweet flavour of the cranberries and the salty taste of bacon create a gorgeous Christmas-esque taste. Doesn’t this just scream Christmas? This would be the ideal sharing food with the family as you wait for the main course. It would be great with all sorts of different dipping sauces and is just a great and unique starter. Now this may sound strange but hear me out. 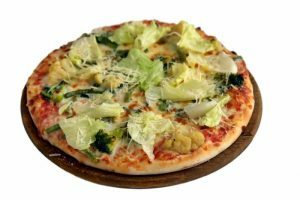 I know what you’re thinking….’Sprouts on a pizza?! You’re insane!’ But honestly, with the smooth creamy taste of Ricotta cheese it makes an obscure but festive flavour. Might be worth a try! So there you go – a range of Christmas themed pizza snacks for you and your whole family to enjoy this festive season! 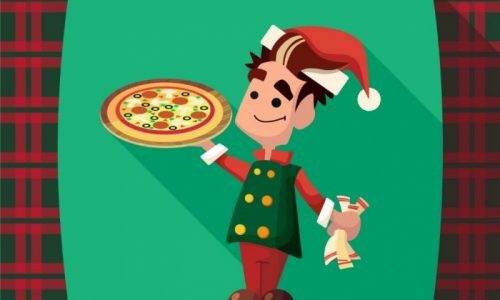 And from all of us here at Cosmo’s Pizzas, have a very Merry Christmas!